East Bay Cyclists is a group of friendly, social cyclists who love to ride in the beautiful San Francisco East Bay. All our rides are no drop. We wait for everyone at the top of hills and at intersections. We have a mixed ability group but value fun and sociability over performance. Our usual pace is between 15-18 mph on the flats. Come ride with us. We would love to meet you. Our Ride Calendar lists our upcoming rides. Just fill out a Ride Waiver, turn up, introduce yourself and have fun. We respect your privacy. We will never sell your email address to anyone ever. We offer two weekly rides. The routes differ each week so the exact details for each ride are on our Ride Calendar. All our rides are no drop. We wait for each other at the top of hills and at intersections. Once a month Frame Up Bikes provides free beer and pizza after the Saturday ride. Please fill out a Ride Waiver and bring it with you on your first ride. A casual after work spin of about 25 miles. Speed on the flat between 15-18 mph. See Ride Calendar for starting points and details. A Longer more challenging ride usually about 40-50 miles. Example routes include Pinehurst Road, Morgan Territory, Three Bears, and Two Bridges. Speed on the flat between 15-18 mph. Stick around to the end of the ride for a liquid refreshment. See Ride Calendar for details. The last Saturday of every month Frame Up Bikes hosts our Saturday Spin ride and provide free pizza and beer at the end of the ride. Usually about 40-50 miles. Speed on the flats between 15-18 mph. See Ride Calendar for details. Here are some of our favorite routes to give you an idea of the kind of rides we do. Out of Moraga and onto the bucolic Pinehurst Road. 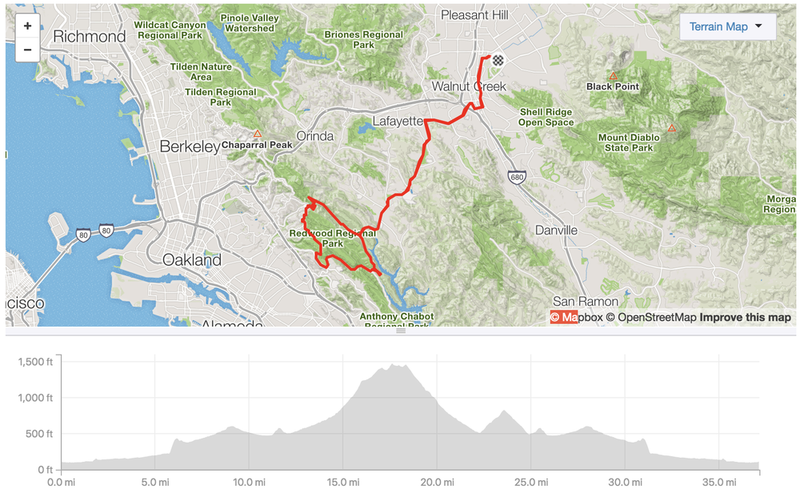 Climb through the pine forests and up to Skyline Boulevard in the beautiful Oakland Hills. Swing down Redwood Road for a breathtaking decent through the sequoias and back to Pinehurst Road. Out to Danville and up South Gate Road to the Junction. If you feel strong perhaps summit. If not descend down North Gate Road back into Walnut Creek. City streets out towards Clayton, dodging the awful Ygnacio Valley Road, and then onto the challenging Morgan Territory climb. Crest the top and get ready for one of the best descents in the area.